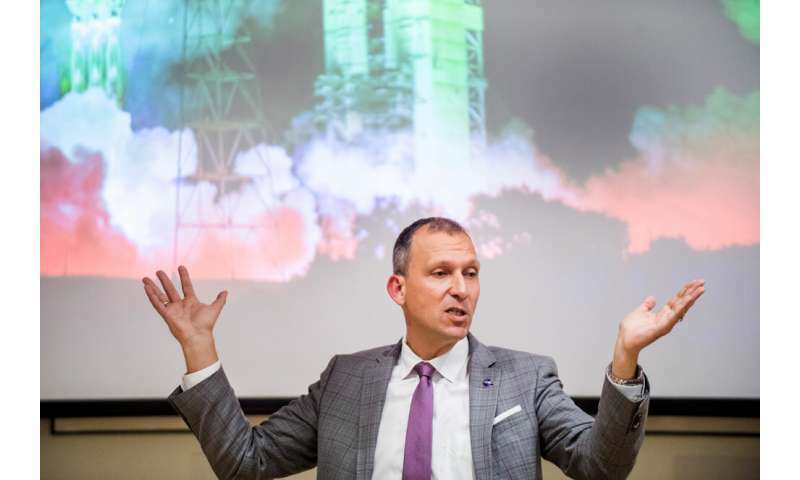 In December 2018, Thomas Zurbuchen, associate administrator for NASA's Science Mission Directorate, visited Boston University to discuss funding opportunities with faculty and researchers. While on campus, he also gave a talk about NASA's current and future missions. Afterward, Zurbuchen sat down with BU Research to talk about the timeline for traveling to Mars and whether he thinks humans are destined to live in a galaxy far, far away. BU Research: Out of all the great unknowns about the universe, what is the one question that you really hope we will answer in your lifetime? Zurbuchen: Is there life beyond Earth? I think the answer is yes—but we just don't know. The simple reason I think so is because we underestimated nature when we doubted whether water or complex molecules would exist beyond Earth. Each one of those is much easier to achieve than we thought possible. We find it right in front of our doorsteps, everywhere, including the polar craters of the planet Mercury. As for how that relates to the chain of life…well, life is much more likely to be out there than we thought before. You haven't been to space yourself. Would you ever like to go? If it's as easy to go to space as it is to go to Paris, I will. Right now, I don't want to spend the weeks and months of training that are necessary for space flight. What do you think about the idea of space tourism? I think it's exciting. Everyone that has been to space says it's a really important experience to have. I imagine it's like being on top of a big mountain, except only around 500 people have ever been in space. How do we open that human experience to others? Speaking of novel experiences, NASA is clearly planning to send human explorers to Mars—as you've outlined, many current missions are building knowledge toward that eventual goal. When do you think humans will be ready? I'd say in the mid-2030s, but things need to happen now in order for us to get there. We need to take humans out of low-Earth orbit to understand the key elements of "Can we survive in deep space?" What are the biggest hurdles to answering that question? Space radiation is a lot more intense away from the protection of Earth's magnetic field. And the farther away from Earth, the more time it takes for astronauts to get to safety—it turns from hours into days, to weeks, to months, or even years. You have to be entirely self-sustainable and self-reliant. As far as communications and operations go, the speed of light is finite. When you're on Mars, that means things have to work autonomously. From mission control, you can pretty much joystick landing on the moon because it's close enough, but you can't do that on Mars. What do you think the first Mars team will be like? The first mission to Mars will be limited in size, because the bigger the mission, the harder it becomes technologically. So, I predict it will be made up of four to eight people. It won't be twenty. But one or two people would also not be good—just because it would be very difficult to address any issues occurring on the way. You've said that diversity is very important to you. Diversity has everything to do with innovation and excellence. There's lots of research that links teams with diverse backgrounds to excellence in innovation—if you want teams that imagine the future better than anyone else, you need people with different backgrounds, races, genders, the list goes on. Groupthink is not the right tool to create excellence; it's useful for making fast decisions but not excellent ones. Is space exploration paving the way for humans to live "off-Earth"? No matter what the answer to that question is, we have to keep Earth livable. It's unsafe to do otherwise. I do think about terraforming other planets a small percentage of the time, but much more time I spend focused on ways to keep the Earth livable and wonderful—not the other way around.